Around our house, a decadent night on the town might very well include a visit to a great steakhouse. We can only justify such indulgence once or twice a year, but when we do, our favorite destinations include Peter Luger in Brooklyn and Keen's in midtown Manhattan. A good porterhouse with all the accoutrements and well made cocktail (usually an Old Fashioned or a Dirty Martini) is pretty much our idea of heaven. The Iceberg Wedge Salad is one of those classic steakhouse sides (much like the Tomato and Onion Salad from our last post), and frankly, whomever first thought up this dish was something of a genius. 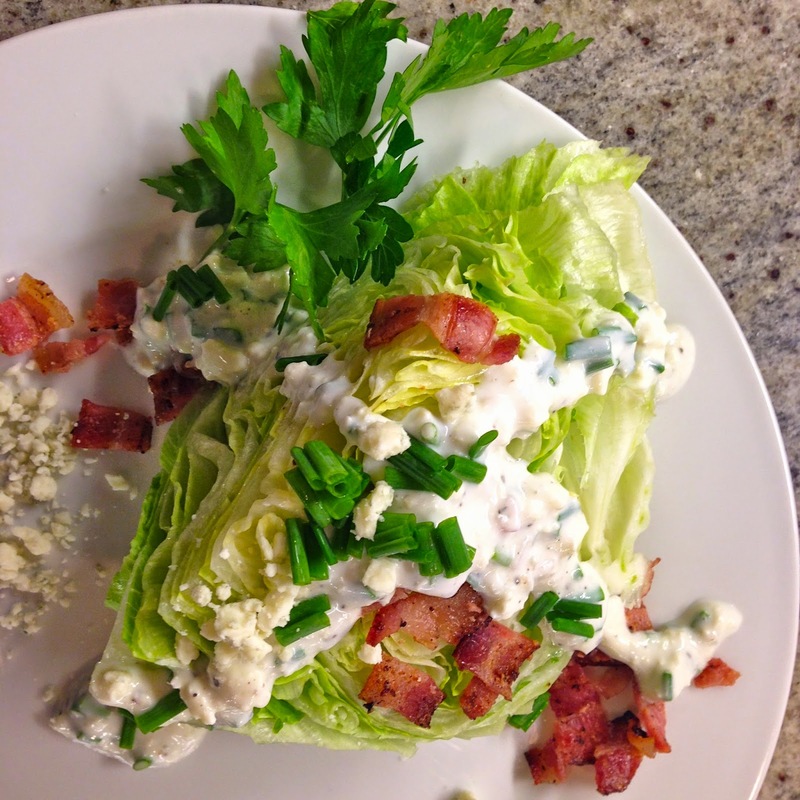 Take a lowly head of Iceberg Lettuce and add some Blue Cheese and Bacon, and boom - you have a salad that costs a few dollars to make that finer restaurants can charge 15 bucks for! But oh, it really is delicious - something that's totally greater than the sum of its parts. That's precisely why when steak night rolled around at our house, we new we'd up the ante by recreating the Wedge at home. Our version definitely hit the spot and we succeeded in bringing that special night out feel to our home cooked meal. You can too, and it only takes minutes! Enjoy! 1. Cut the head of Lettuce into equal fourths and place each on a serving plate. 2. In a medium bowl, combine Sour Cream, Chives, Shallot, Buttermilk, Vinegar and about 3 ounces of the Blue Cheese (reserving an ounce for sprinkling on top of the salads later). Mash the Blue Cheese into the dressing mixture. If you prefer a thinner consistency add extra Buttermilk teaspoon by teaspoon. Taste and add Salt and Pepper as desired (remember that Bacon will add a bit of saltiness). 3. To serve, drizzle each portion with Dressing, sprinkle with some extra Chives, and scatter with 1/4 of the Bacon pieces. Serve and enjoy!